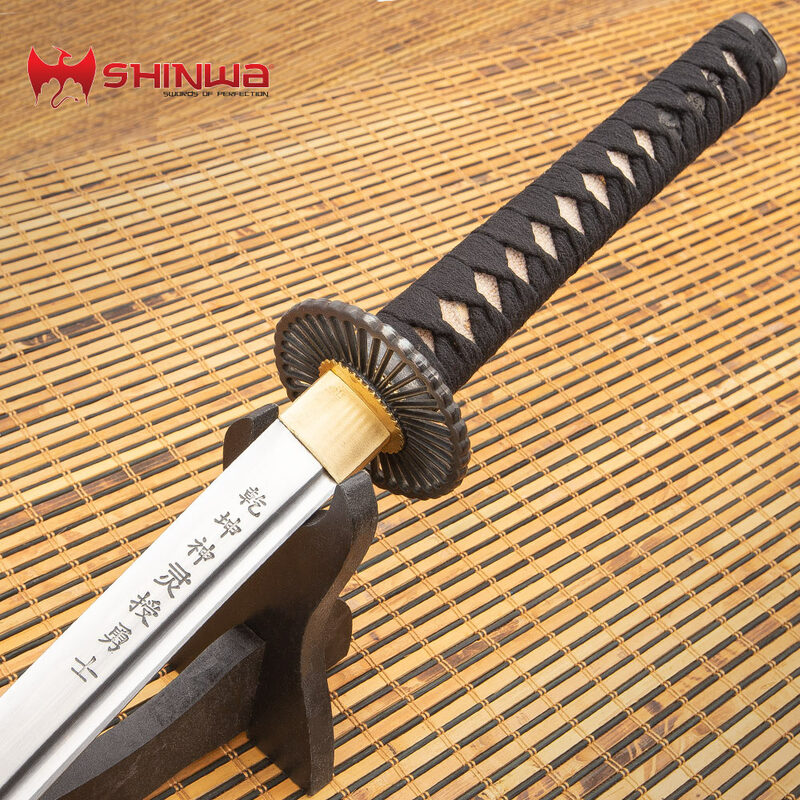 Emblazoned with the Warrior’s Creed, this Shinwa katana’s 28 in. carbon steel blade is super sharp. It has a sleek look with its black lacquered scabbard and black cord-wrapped wooden handle which features real fish skin. The decorative tsuba is of cast metal. It has an overall length of 40.75 in. This thing is SOLID! I actually was surprised how great the quality was. No loose parts, and it doesn't rattle at all. It feels like a high dollar weapon and the balance is amazing. Be warned, this may have a low price tag but it is not a toy or a wall hanger. You can be seriously injured by this sword. As far as the sharpness? It came with a decent edge, but after a bit of work with the low grit whetstone this thing takes the hair off of my arm all the way down without even putting any pressure at all. It is a razor now and the edge has held perfectly. Seriously, I had to move it up to my attic when we had company over so that none of my dumbass friends ended up in the emergency room lol. It is also very nice to look at as well. I bought a stand up single katana stand and it fits perfectly. My only complaint (and it's minor) was that after the first time I applied a bit of blade oil, the ink in the engraving wiped off a little. There's still ink in the grooves, but it's not as dark as when I first got it. Not really a big deal though. 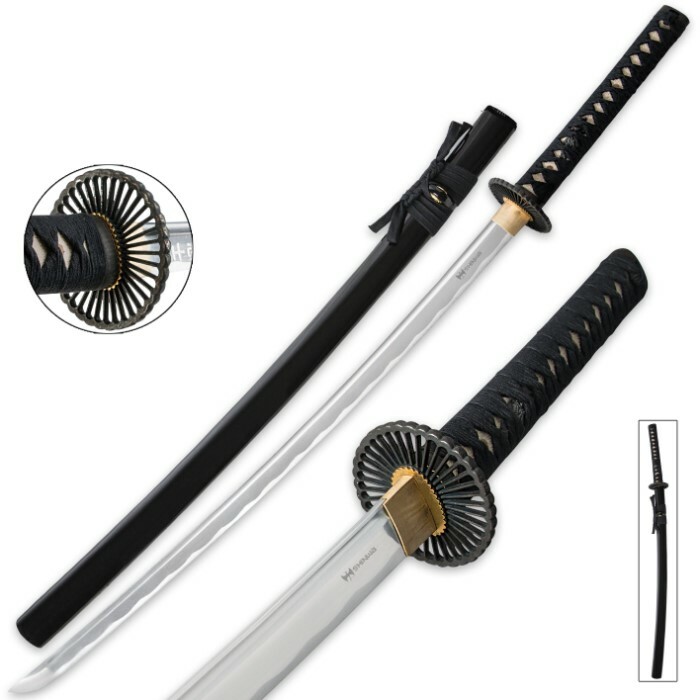 If you're looking for a katana you can actually have fun with and not have to dodge your landlord because you used up all of your rent money on one, look no further because you have found what you seek grasshopper. Have fun and watch the fingers boys. Nice sword for the money like somebody else said it’s nice and straight no wobbles nothing rattles one question I would like to know what the Japanese characters translate to? Other than that being a mystery I really like the sword for the money I got a discount code and paid $38.82 for it you can’t beat that. And it came pretty sharp for right out of the box I was impressed with that most of them show up pretty dull. I would recommend to a friend. 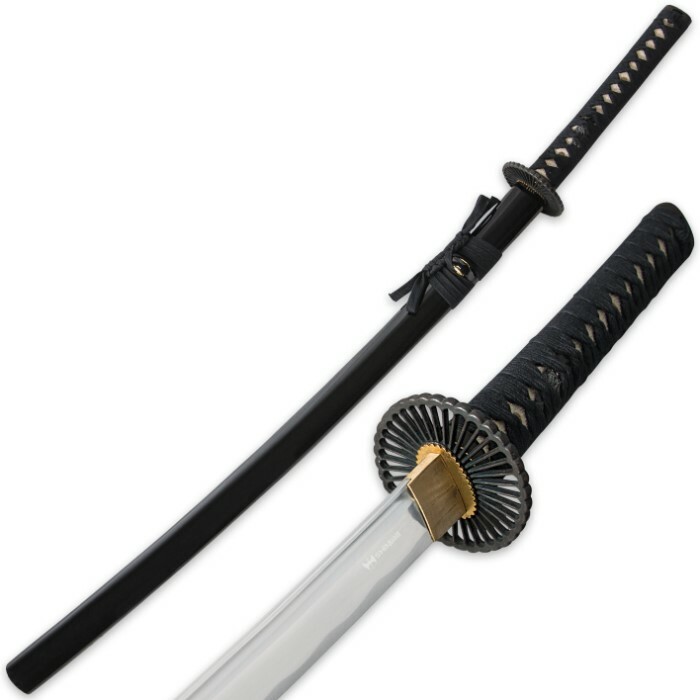 I bought this sword, and to be honest I was kinda skeptical. I was surprised to find out how good of condition the sword is. It's a quality blade, with no rattle whatsoever. Very VERY solid. Nice and heavy too. The reason I give this a 4 star instead of a five star, is because I was looking at this sword in the Damascus category, and expected it to be a Damascus blade, which it isn't. It's carbon steel, not Damascus. Other than that small issue, I'm very pleased with this sword. It's a quality blade for a reasonable price. Id recommend it. 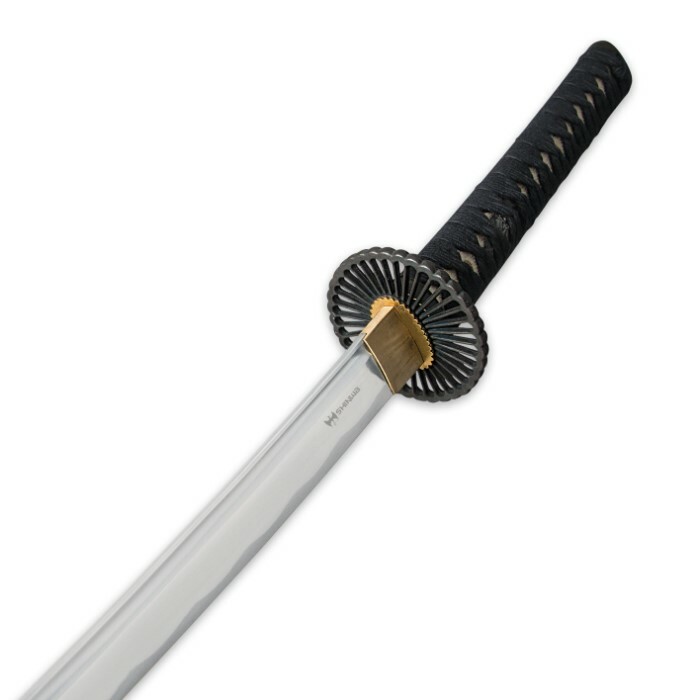 I was a little nervous buying this sword because of its low price and no reviews. I got much more then what I expected, a high quality and beautiful blade, I am very impressed BUDK. It's very solid, no rattle at all, sharp and feels like a true sword. I would buy again. Also, long for me drawing wise but I am a rather short guy, for the average person this would be perfect.